Dr. D. E. Bostwick, father of noted librarian and author Arthur E. Bostwick, was crossing the village green in Litchfield, Conn. sometime in 1870. A hot liner from a nearby baseball game struck him in the eye, knocking him to the ground. While Dr. Bostwick recovered from the injury, his son Arthur wrote in 1930 that his father “might have been killed by it.”(1) The accident, he believed, may have resulted in the game of baseball being banned on the Litchfield town green. By the 1870s, baseball had taken hold in America, with sports journals already touting the game as “America’s pastime.” Luckily for the residents of Litchfield, there was always wicket. Engraving of a wicket match at Dartmouth College. Courtesy of John Thorn. 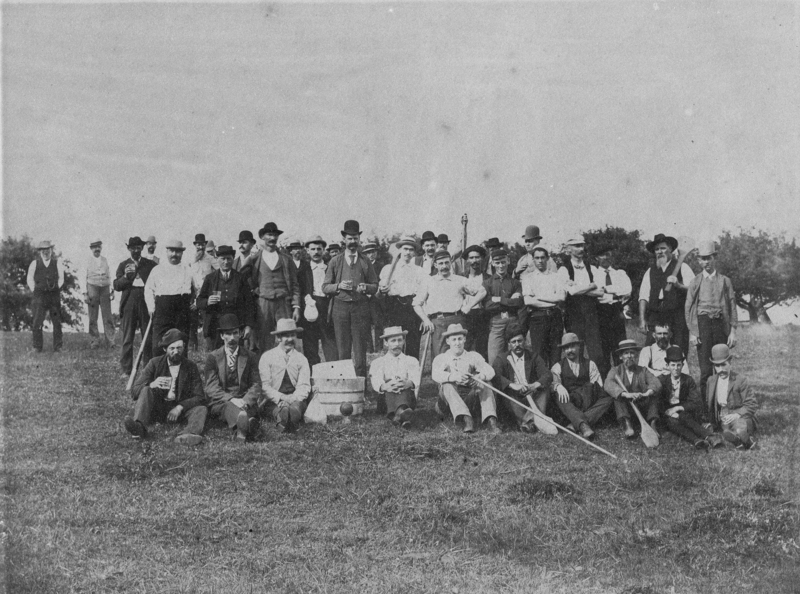 Photograph showing the Poquonock Drum Corp at a clambake and wicket game played in J. M. Brown’s pasture in Poquonock, July 4, 1890. Two wicket bats, a wicket ball, and the two wickets are visible. Courtesy of the Windsor Historical Society. Connecticut Courant, Volume 70, Issue 3618, Page 3. Courtesy of John Thorn. Lacking any definitive set of rules for the sport, wicket play varied greatly. Some, including Seymour and his Yale classmates, adapted wicket to work with time restrictions and a more limited number of players. 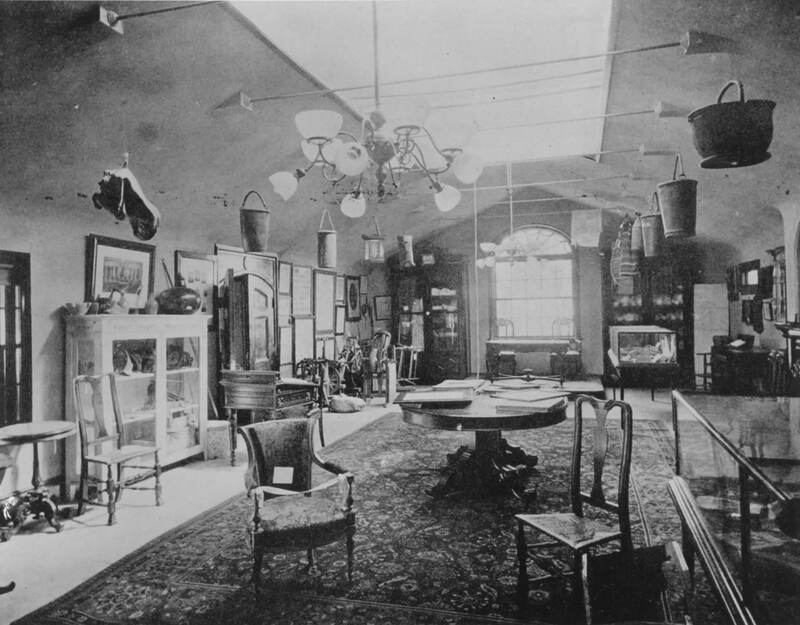 Store clerks in Hartford in the early 1850s held shortened games in various locations across the city, with the “best games of all in many respects” being the early morning games played on Main Street and in State House Square. Sec. 1 Bounds &c. The wicket bounds shall be eight feet in width, and the wickets seventy feet apart. The wickets shall be six feet in length and shall stand four and one half inches above the ground; the ball not being more than five inches in diameter. The centre-line shall be midway between the wickets: and the tick-marks six feet in front of their wicket. Sec. 2 Bowling &c. Before delivering the ball the bowler must first step one or both feet over his wicket, the ball must strike the ground before reaching the centre-line and must be within the bounds. Any violation of these rules will be adjudged “no bowl”. Underhand throwing will not be allowed. No tally will be allowed on balls stricken which are not correctly bowled. Sec. 3 Putting out. In putting out a striker the bowler must stand astride of his wicket and must strike off the wicket from the inside with the ball, which is to be firmly held in one or both hands: When the wicket is thus struck off the batsman is to be adjudged out unless he has placed his bat upon or within the tick-mark, before the wicket is so struck off. Sec. 4 Batting. The batsman shall not go outside the bounds to strike a ball, and no tally can be allowed on a ball so struck. If he knocks off his own wicket either with his bat or person he shall be out. He must in ticking place his bat upon or within the tick-mark. If he arrives at his tick-mark and fails to put down his bat to the Ground he may be put out by the bowler. If a batsman’s wicket is knocked off by a ball struck by the opposite batsman he shall be out, unless the batsmen shall have crossed each other, in which case the one who struck the ball shall be out: the wicket becoming his after crossing. Sec. 5 Tallying. No tally can be made on a ball adjudged “no bowl”; and the batsman can be in no way put out by such a ball. To make a tally the batsmen must have crossed each other, and they must place their bats upon or within the tick-marks before making a second tally. If the ball is struck and the striker caught out, a tally shall be allowed if the batsmen have crossed each other before the ball is so caught. Sec. 6 Shams. Three shams shall be adjudged out; and a ball, properly bowled, striking any part of the body before touching or being touched by the bat shall constitute a sham. Sec. 7 Fielders. Fielders shall not go inside the bounds until after the ball is struck, and then only for the purpose of catching or fielding the ball. In catching, the ball must be taken on the fly and held firmly in the hands or hand, and not against the body: if the ball bounds in the hands it will not be considered caught and the striker will not be out. A ball is considered as in the bowlers hands when it has been thrown to him and has reached or passed the wicket bounds, whether the bowler has actually secured the ball or not, and no tally can be made after the ball is thus in: if the batsmen have crossed, however, before the ball is in, they may complete the run after it is in, and are liable to be put out by the bowler in so doing. Sec. 8 The umpire is to be the sole Judge of the game, but in case of inability to observe correctly, he may ask information of players or bystanders and make use of the same at his discretion. The fielders had two jobs: catch the batter out or assist the bowler in putting the batter out. Most rules indicate that struck balls needed to be caught in the air to register an out, usually with an accompanying clarification like “a ball caught before striking any other object but the catcher is out.” Some rules, however, permitted fielders to catch a ball on the first bound to record an out. (43) The Litchfield Wicket Club had perhaps the most specific rule for fielding, requiring the ball to be held firmly in the catcher’s hands (and not against his body) without being bobbled. Fielders could also throw the ball to one of the bowlers in an attempt to put a batter out. In “putting out” a batter, the bowler must stand astride his wicket or behind it and use the ball to strike off the wicket from the inside. If he can do so before the batter has safely crossed (either by reaching the wicket or placing his bat beyond the tick-mark, depending on what rules are in play), the batter is out. Batters were also out if they knocked off their own wicket while attempting a hit, or if they knocked of the opposite wicket with a struck ball. (44) When a batter was out, the next man in the batting order took his place; by most accounts, three outs were considered a side out and ended that half of the inning. Wicket alley according to 1874 rules of the Litchfield Wicket Club. Most sources use the word “alley” when referring to the layout of a wicket field. The alley could be any smooth surface of hard ground, be it a well-maintained and skinned grass surface or a patch of rolled dirt with the grass removed. (45) Some, like the boys at Hiram College, played the game on cobblestone or dirt streets. In terms of how the game is played, the wicket alley functioned much the same as the pitch in cricket. However, very few accounts make any mention of the size or layout of the rest of the wicket field, although some do mention outfield and infield players. The length of the alley differs from source to source, but it is most commonly listed as being 75 feet long and between 8 and 10 feet wide. The Litchfield Wicket Club played on an alley 70 feet long. Shorter alleys of 60 feet and even 40 feet were used in Rochester and Michigan, respectively. (46) Some descriptions of the game mention the center line or “centre-line,” located at the halfway point of the alley, which was used in deciding whether a ball was properly bowled. Fewer accounts make mention of tick-marks, which some clubs used to demarcate the minimum distance from the wicket that a runner needed to pass in order to record a tally. The Litchfield Wicket Club set the tick-marks at 6 feet. The length and construction of the wickets also varies between sources, but is discussed in a larger number of accounts than almost any other aspect of the game. Unlike cricket, in which a wicket is formed by three vertical stumps with two bails resting on top, the game of wicket utilizes a single horizontal wicket resting on two vertical uprights. The Litchfield Wicket Club used 6-foot wickets placed 4.5 inches off the ground, but made no formal mention of how they were to be constructed. 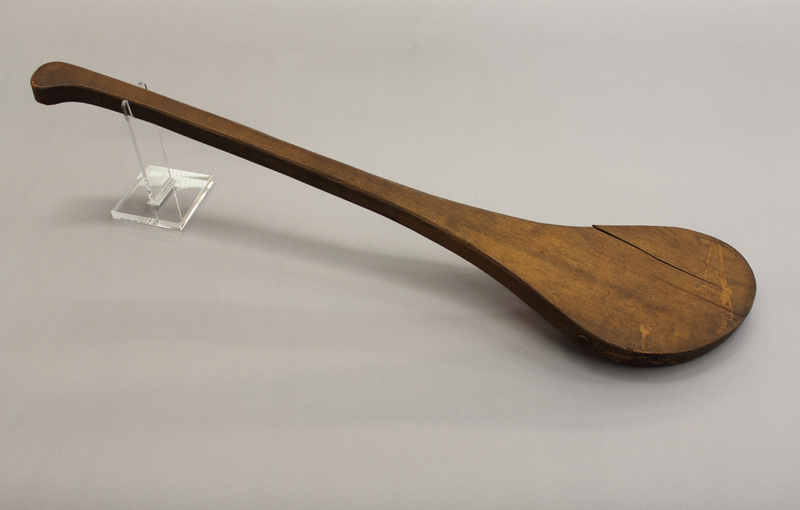 Edward Hitchcock, a wicket player at Amherst, noted that their wickets were made of two sticks of pine, an inch square and 8 to 10 feet long, placed on wooden blocks. (47) Another account describes the wickets in Bristol as comprised of “two pyramids of wood on top of which is a slender stick about five feet long.” (48) When Bristol went to Brooklyn to challenge the Ansonia Company team, the wickets were described as “two pieces of white wood” about an inch square and six feet long, resting on three-inch blocks. (49) Even the shorter wicket lengths of 4 or 5 feet represented a much wider target for wicket bowlers than for their cricket counterparts. Members of the Essex Base Ball Club and other teams try their hands at a game of 19th-century wicket. Note the position of the fielder behind the wicket to serve as catcher. Courtesy of the Essex Base Ball Club website. This description is of particular interest because it both stipulates a drastically smaller number of players on the fielding side and applies the positional terminology of baseball to wicket. A wicket bat and ball in the collection of the Windsor Historical Society. The bat and ball are seen in a photograph of a wicket game and clambake held on July 4, 1890 in Poquonock. Courtesy of the Windsor Historical Society. One of two wicket bats in the collection of the F. N. Manross Memorial Library, Forestville, CT. Courtesy of the F. N. Manross Memorial Library. 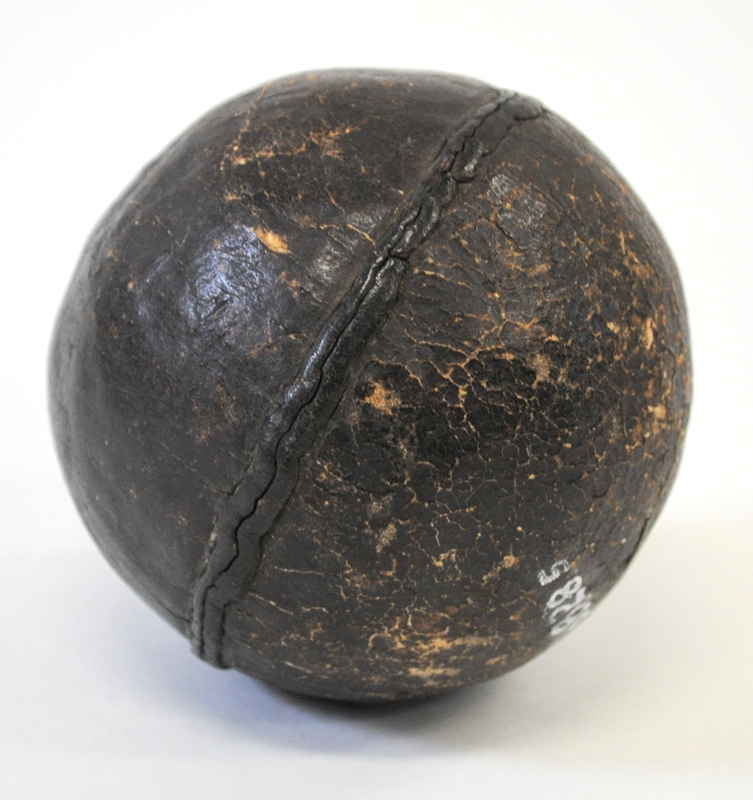 A wicket ball in the collection of the Windsor Historical Society. Courtesy of the Windsor Historical Society. It’s been almost 150 years since Dr. D. E. Bostwick was struck by a baseball while crossing the green in Litchfield. In that time, baseball has grown into a dominant sport both in America and abroad. Wicket, on the other hand, has almost entirely disappeared. Once played from Hawaii to Connecticut, the game of wicket is now only a pastime of historians and enthusiasts of America’s early ballgames. But while wicket games are rarities in the 21st century, the sport’s history is more accessible than ever. With any luck, village greens around New England may once again host afternoon contests between rival towns, with the losing side, as is tradition, paying for dinner. Special thanks go to John Thorn, Larry McCray, and Brian Sheehy for their assistance with this research and their contributions to the study of early American ballgames. I would also like to thank the Windsor Historical Society and the F. N. Manross Memorial Library for allowing me to photograph wicket items in their collections. Anyone interested in learning more about wicket is encouraged to visit the Project Protoball website as well as John Thorn’s blog Our Game, or can contact the Litchfield Historical Society at curator@litchfieldhistoricalsociety.org. (1) Letter from Arthur E. Bostwick to Col. Samuel H. Fisher, Litchfield, Connecticut, dated September 30, 1930. (2) Ray Hardman, “Before There Was Baseball, There Was Wicket.” WNPR, October 31, 2013. http://wnpr.org/post/there-was-baseball-there-was-wicket#stream/0. (3) Frederick Calvin Norton, “That Strange Yankee Game, Wicket” in Eddy N. Smith, George Benton Smith, and Allena J. Dates, Bristol, Connecticut, In the Olden Time “New Cambridge,” Which Includes Forestville (Hartford: City Printing Company, 1907). Originally published in the Hartford Courant, 1904. (4) Larry McCray, “State Championship Wicket Game in Connecticut: a Hearty Hurrah for a Doomed Pastime.” Accessed via Our Game, a blog run by John Thorn, the official historian for Major League Baseball. http://ourgame.mlblogs.com/2012/08/17/championship-wicket-game-in-connecticut/. Originally published in a special issue of the journal Base Ball. (5) George Dudley Seymour, “The Old-Time Game of Wicket and Some Old-Time Wicket Players” in Papers and Addresses of the Society of Colonial Wars in the State of Connecticut, Proceedings of the Society, Vol. II (New Haven: The T. M. & T. Press, 1909) pp. 269-303. (6) Protoball, Wicket Chronology, Item No. 1725C.I. “Wicket Played on Boston Common.” http://protoball.org/1725c.1. (7) Protoball, Wicket Chronology, Item No. 1778.4. “Ewing Reports Playing ‘At Base’ and Wicket at Valley Forge – with the Father of his County.” http://protoball.org/1778.4. (10) Protoball, Wicket Chronology, Item No. 1857C.34. “Wicket Played at Easter OH College; Future President Excels.” http://protoball.org/1857c.34. (11) Protoball, Wicket Chronology, Item Nos. 1844.13, 1855C.10, 1857.27, and 1862.20. http://protoball.org/Chronology:Wicket. (19) “Those Games of Wicket,” Litchfield Republican, July 6, 1848. (20) “Wicket Playing,” Litchfield Republican, August 10, 1848. (21) Protoball, Wicket Chronology, Item No. 1834.6. 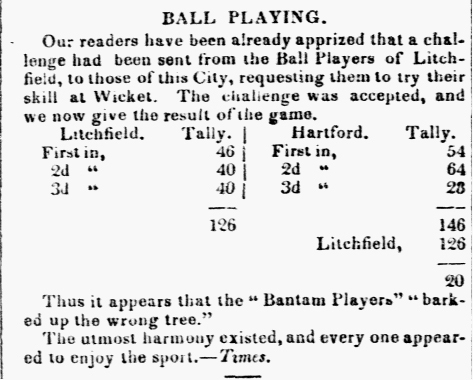 “In Wicket, It’s Hartford CT 146, Litchfield CT 126.” http://protoball.org/1834.6. Taken from Connecticut Courant, v.70, n.3618, p.3. (22) “Rough and Ready versus Bantam Wicket Club,” Litchfield Republican, August 1848. (24) “That Game of Wicket,” Litchfield Republican, July 8, 1852. (30) Axel Bundgaard, Muscle and Manliness: The Rise of Sport in American Boarding Schools (Syracuse: Syracuse University Press, 2005), p.41. (31) Protoball, Wicket Chronology, Item No. 1852C.11. “Hartford Lads Play Early Morning Wicket on Main Street.” http://protoball.org/1852c.11. (32) Protoball, Wicket Chronology, Item No. 1841.10. “Bloomfield CT Wicket Challenge: ‘One Shamble Shall Be Out.’” http://protoball.org/1841.10. (34) Protoball, Wicket Chronology, Item Nos. 1840S.28 and 1841.10. http://protoball.org/Chronology:Wicket. (35) Protoball, Wicket Chronology, Item No. 1849.14. “Westfield Upsets Granville in Wicket.” http://protoball.org/1849.14. (38) The Litchfield Wicket Club rules stipulate that the bowler must have at least one foot over the wicket before releasing the ball, while Bartholomew and other sources say that the bowler must pass fully over the wicket. (39) Protoball, Wicket Chronology, Item No. 1850S.16. “Wicket Play in Rochester NY.” http://protoball.org/1850s.16. (40) 1850S.16 makes a mention of batter’s having to “touch the stumps” when crossing. The Litchfield Wicket Club and Bartholomew, among other sources, state that batters had to touch their bats on or behind the tick marks and make no mention of them having to touch the wicket uprights or “stumps” themselves. (43) Protoball, Wicket Chronology, Item No. 1850S.16. “Wicket Play in Rochester NY.” http://protoball.org/1850s.16. (44) Norton, “That Strange Yankee Game, Wicket” and Litchfield Wicket Club, 1874 Rules. (45) Protoball, Wicket Chronology, Item No.1855C.3. 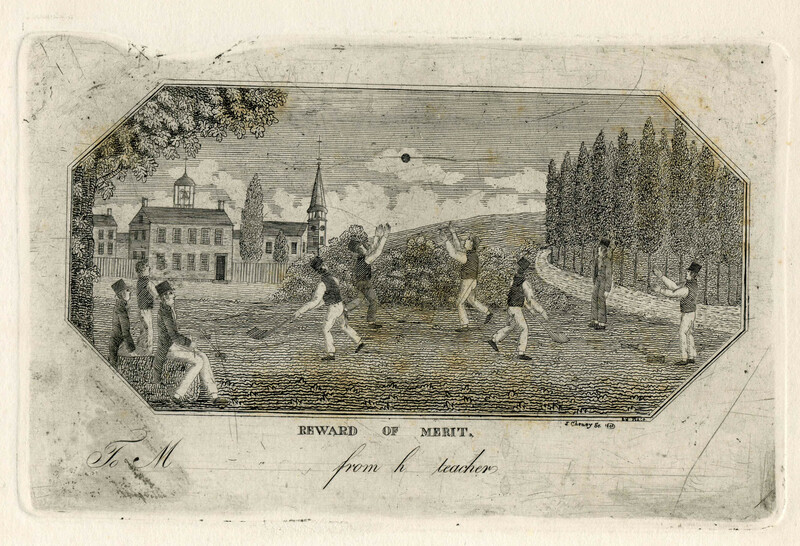 “Demo Game of Wicket, Seen as a CT Game, Later Played in Brooklyn.” http://protoball.org/1855c.3. (46) Protoball, Wicket Chronology, Item Nos. 1850C.35 and 1850S.16. (47) Protoball, Wicket Chronology, Item No. 1846.7. “Amherst Juniors Drop Wicket Game, 77 to 53: says Young Billjamesian.” http://protoball.org/1846.7. (49) Protoball, Wicket Chronology, Item No. 1855C.3. “Demo Game of Wicket, Seen as a CT Game, Later Played in Brooklyn.” http://protoball.org/1855c.3. (50) Protoball, Wicket Chronology, Item Nos. 1840S.28 and 1855.26. (51) Protoball, Wicket Chronology, Item No. 1846.7. “Amherst Juniors Drop Wicket Game, 77 to 53: says Young Billjamesian.” http://protoball.org/1846.7. (52) Protoball, Wicket Chronology, Item No. 1850S.16. “Wicket Play in Rochester NY.” http://protoball.org/1850s.16. (54) Hartford Courant, October 14, 1907; The News-Weekly, September 30, 1949; and Protoball, Wicket Chronology, Item No. 1855C.3. (55) Protoball, Wicket Chronology, Item Nos. 1830S.5, 1846.7, and 1855C.3. (56) Protoball, Wicket Chronology, Item No. 1830S.5. “Wicket Played in the Western Reserve [OH].” http://protoball.org/1830s.5. (57) Protoball, Wicket Chronology, Item No. 1855C.3. “Demo Game of Wicket, Seen as a CT Game, Later Played in Brooklyn.” http://protoball.org/1855c.3. (58) The News-Weekly, September 30, 1949, and Protoball, Wicket Chronology, Item Nos. 1830S.5, 1846.7, and 1857.19. (59) Protoball, Wicket Chronology, Item No. 1850S.16. “Wicket Play in Rochester NY.” http://protoball.org/1850s.16. (60) Protoball, Wicket Chronology, Item No. 1846.7. “Amherst Juniors Drop Wicket Game, 77 to 53: says Young Billjamesian.” http://protoball.org/1846.7. (62) Hartford Courant, October 14, 1907. (63) Gary Goldberg-O’Maxfield. “Wethersfield’s Glorious Baseball History.” February 5, 2012. http://wethersfieldhistory.org/articles-from-the-community/wethersfields_glorious_baseball_history/. This entry was posted in Exhibits on July 5, 2016 by Alex Dubois.